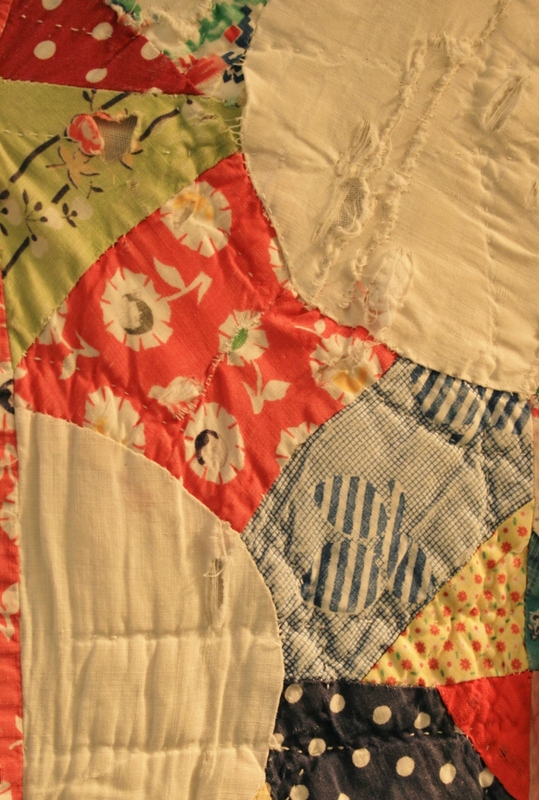 You may have spied the recent additions to my FLICKR account, which include a couple of my vintage quilts. I wrote about using them to decorate and quiet an echo chamber hallway in my home over at Kitsch Designs. 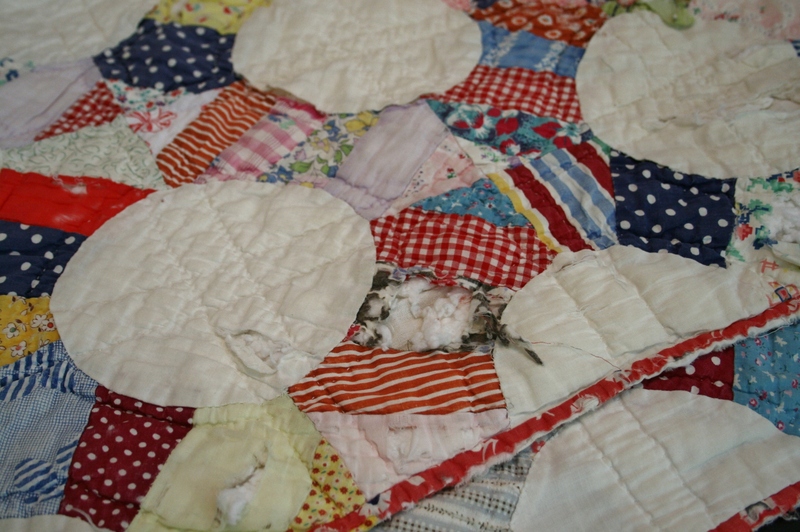 Both quilts were old and tattered when I gained position of them years ago. Rather than fixing them up to use I just let them live on shelves for a pop of color because I feared they would not be able to handle regular wear and tear any more. Now that I live in a larger home with what seems like immense expanses of wall space (not really, it just seems that way because our old home was SO small) I keep bringing those old quilts out in hopes of using them for display. The problem is they looked like Swiss cheese…Swiss cheese with stuffing falling out all over! I knew if I wanted to use them to add color and fun pattern to my walls I should stitch them up so they were not big eyesores. I like a little shabby chic in my spaces, but there is a line of shabby that I don’t like to cross very often and this was one of them. 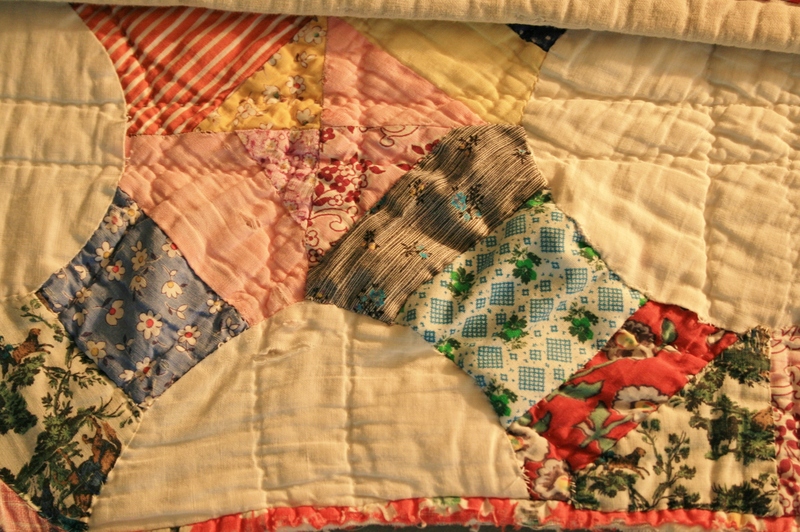 The lighter quilt that I used for art in my home was the worst of the two and the main problems were applique stitches that had come loose or were just gone. 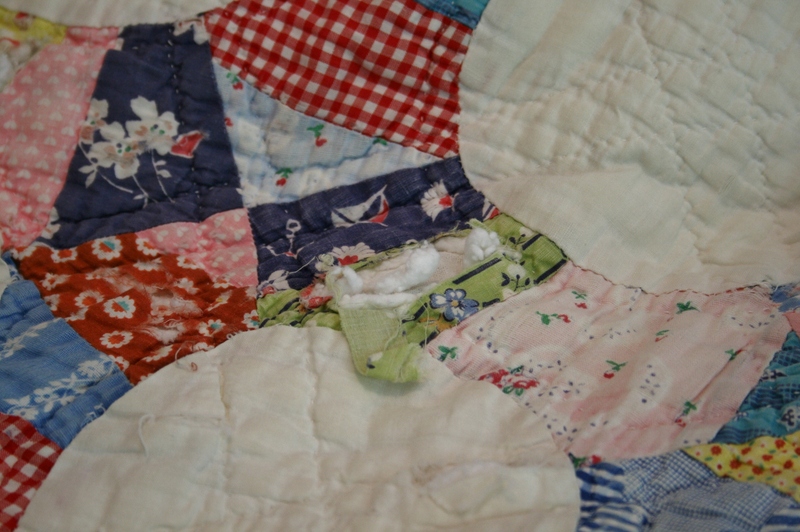 There were also several fabrics that had not held up well over the years and when I held the quilt up you could see worn spots where these had literally disintegrated. I found a similar fabric to the worst patches and replaced those just by cutting scraps and hand stitching them back into place directly over the holes. In some instances I just could not come up with anything from my vintage fabric stash that matched, so I simply patched them with hand stitching. Since this was an old quilt, that had been well-loved, the Frankenstitches (as I like to call them) fit in just fine and added to the texture. I did not do a complete overhaul on this quilt once I decided to use it as a frame for another quilt and because I didn’t want to take too much away from it’s nicely worn look and feel. I’m still on the fence, though, about whether it’s too country kitsch for our home. hhhmmmmm…..? ?